With the Software Development Kit (SDK) for iPhone 3.0 unveiled Tuesday, Apple introduces more than 1,000 new Application Programming Interfaces (APIs) for iPhone application developers to use. Front and center at Tuesday’s iPhone 3.0 event were some of the new API’s for game developers. Now that game developers have had an opportunity to digest some of what it means, they’re ready to talk. One of the most sought-after features game developers have requested is what Apple calls In App Purchase. This lets developers create additional content for apps that users can buy after they’ve made their initial purchase. Known in game developer’s parlance as DLC, or downloadable content, In App Purchase promises to alter the way that people play games on their iPhone. To demonstrate how the technology works, Apple had two leading publishers of games for the iPhone, EA Mobile and Ngmoco, show off new titles currently in development that will make use of this feature. EA Mobile showed off the iPhone version of The Sims 3, with a virtual stereo that users can buy during the game to let their Sims listen to the music stored on the iPhone’s music library. Ngmoco showed off LiveFire—a first-person shooter currently in development—and its ability to let users buy new weapons to get the upper hand in multiplayer combat. 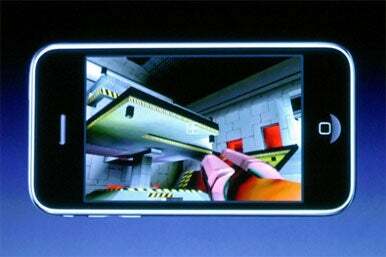 Ngmoco demonstrates LiveFire during Tuesday’s iPhone 3.0 event at Apple headquarters. The game figures to take advantage of new iPhone 3.0 features such as peer-to-peer connectivity. Ngmoco’s Chris Plummer explained in a recent blog post that while it’s still early in LiveFire’s development, the company has some specific ideals about how In App Purchase will work. Producing add-ons for games that are meaningful could be a great value proposition for game developers, as long as they’re not fleecing the customer, says Colin Lynch Smith of Freeverse Software. Freeverse has had a string of iPhone game hits like Days of Thunder, Flick Sports Fishing, and SlotZ Racer. Brian Greenstone, president of Pangea Software, thinks that In App Purchase is a great idea. Pangea’s iPhone games are largely made up of retreads of its hit Mac games, such as Enigmo, Cro-Mag Rally, and Otto Matic. “It’s got me wondering how I could add it into some of our existing games,” said Greenstone, adding that it will take some trial and error to figure out what customers of existing titles are willing to pay for. Another feature in the iPhone 3.0 SDK that has game developers’ tongues wagging is what Apple calls Peer to Peer Connectivity—a new way of adding multi-user capabilities to applications. Specifically in terms of gaming, this provides a framework for game developers to create network connectivity for their games using Bluetooth as the medium. That way, iPhone or second-generation iPod touch users within close proximity to each other will be able to play games without needing to use a 3G network and without needing to be on Wi-Fi. Greenstone heralds this as the return of Net Sprocket, a part of Apple’s “Game Sprockets” framework that was discontinued with the advent of Mac OS X. Net Sprocket made it much easier for game developers to integrate networking for their games, and its loss was keenly felt by long-time Mac game developers like Greenstone who made the transition to OS X. “It definitely opens up new ways for us to create more social game experiences,” Freeverse's Smith agrees. He sees it as complementing other efforts like Facebook Connect, the social networking site’s recently introduced iPhone programming technology that lets game developers use Facebook as a way of sharing data like high scores. Another developer looking forward to the changes in iPhone 3.0 is SGN, whose name is an acronym for Social Gaming Network. Its iBowl, iBaseball, and SGN Golf games have separated themselves from the pack by offering a Wii-like experience that immerses iPhone users in the game, encouraging them to swing their arms around as if they’re using a real baseball bat, golf club or bowling ball. Most recently, the developer released Agency Wars, a secret agent-themed game that leverages Facebook Connect technology and geolocation. “Our vision for offering our engaged audience unique and immersive games is further being realized with this announcement from Apple,” said Shervin Pishevar, SGN’s president and CEO, in a statement. The company sees efforts like In App Purchase and Peer to Peer Connectivity as in lockstep with efforts they’ve already made to encourage users to play socially and to add on content they’re interested in.